Fan Letter #2: The next letter is from aMa no Jaku. They’re writing for the first time to say how much fun their live in Nagoya was (as they expected it to be). They hope that Juice=Juice will continue to do well and give great performances as the tour goes on. Karin remembers that when they went to Nagoya, they went to eat Shironowhirl and ogura (chunky red bean paste) toast, which was the first time Uemu had eaten ogura. Shironowhirl is essentially bread (a danish, to be precise) with ice cream on top, and Karin expected that the ice cream would melt down and sink into the bread to make it nice and moist, but hers didn’t seem to sink. Her manager’s dish did have the ice cream at the bottom, though, so she took hers and it was very good. She also had some matcha cider while she was there and she saw that the name of the cider was written with the final kanji in ‘matcha’ also as the first character of ‘cider,’ and she didn’t know what to think. 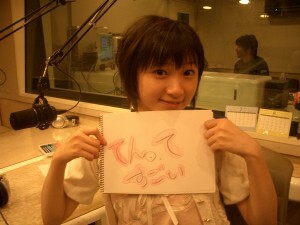 She says she told a lot of people about it at the handshake event. Fan Letter #3: The third letter is from Pirozhki, who was at the Nakano Sun Plaza Hello!Con where Berryz Koubou announced their indefinite hiatus and was shocked by it. They wonder if what Juice=Juice were feeling at the time of the announcement since they have gone around the country with Berryz on the Naruchika tour. Karin says they were all surprised, but Uemu wrote a very sincere blog on the subject. Uemu says that it was actually very difficult writing it because her blog is normally so lighthearted. She wrote a lot and didn’t get the blog submitted until the next day as a result. 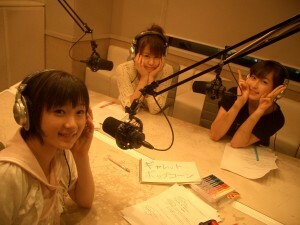 Karin reflects on the time she spent in stage plays with them. She mentions that Natsuyaki Miyabi would let her sit on her lap and would help her put on eyelashes and such, so she has a lot of fond memories with them. It hasn’t even hit her yet, she admits, and she has no idea what she’ll do when their time together runs out. Sayubee adds that she can’t imagine a Hello!Project without Berryz, that it’s so normal for her to see them all the time that she can’t grasp them being gone. Berryz taught them a lot by example on the Naruchika tour and even when they got mad at Juice=Juice, Sayubee always felt that they gave off an aura of professionals since they’ve been doing it since they were little. It’s sad and lonely to think about, but Sayubee thinks that this is the most important time for everyone to work as hard as they can. She wants to learn as much as she can from them while she can. Karin was drawing a fine-point pencil and came to the realization that lines and drawings are all made up of a series of innumerable points, and that is amazing. When she started thinking about it, it went to a much bigger scale. Cells are also like points in that everything living is made up of a collection of them, and so you could say the earth is made up of points, and the whole universe is made up of points. It made her think that we can learn a lot from the little things. The closing word is mechanical pencil because Sayubee has determined that a mechanical pencil makes her writing a lot cleaner and so it is her favorite thing to write with. Earlier during a meeting, a staff member commented on how good her handwriting looked, and she said it was because of her mechanical pencil. So there you have it. nice to see Lurkette joining the team on HPR! !